Fragrant and sweet, Shou Mei tea is a white Chinese tea characterized by its bold flavor. Why is this white tea so special? 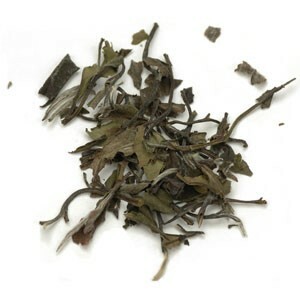 With a combination of tea buds and crescent-shape tea leaves, this tea contains fewer leaf tips than other white teas. And unlike other delicate white teas, such as Silver Needle or White Peony, a sip of Shou Mei will instantly remind you of the lighter, less fermented oolongs teas. this wonderful Chinese white tea. What is Shou Mei Tea? This Chinese white tea was first created in the Fuding county in the Fujian province in China and today is it also grown in the Guangxi province. Shou Mei is also known as Long Noble Life Eyebrow, due to its thin and crescent-shaped leaves that resemble eyebrows. It can also be found under other names or different spellings such as Shu Mee, Sow Mei, Shou Mei Wang, Cha Wang Shou Mei, Longevity Eyebrow or Longevity Eyebrow King. Once the tea leaves are harvested they are set to naturally wither under the sun. This tea undergoes almost no oxidation, just a slight natural process that gives it its dark color and bold flavor. Finally tea leaves are dried and packaged careful so as not to damage the leaves unnecessarily. This tea is considered a low grade white tea as it uses only a few buds and 2-3 leaves that are plucked after those for White Peony (Bai Mu Dan), thus resulting in darker tea, though with greater strength. What seems to define the similarity of this tea to that of oolong teas is the result of this late harvesting of the tea leaves. Using large, more mature, with full fine hair on the surface, multicolored whole leaves make this a lower grade tea, certainly less expensive than the more refined and rare Silver Needle tea. Shou Mei tea is rich in antioxidants like all other white teas, which makes it a beverage filled with health benefits. As with other white teas, one of the most important white tea health benefits present in this tea is the ability to help prevent the onset of cardiovascular diseases. Full of vitamins, minerals and antioxidants, this Shou Mei tea may help lower blood pressure, reduce bad cholesterol, improve blood circulation and regulate sugar levels. The simple act of drinking a daily cup of this tea may aid in reducing the risk of stroke, formation of blood clots or the occurrence of heart attacks. Your body faces constant pressure: pollution, viruses and bacteria are all around and put your health at risk every day. Better that treating a disease is preventing it and you may achieve this by boosting your immune system on a daily basis! Shou Mei tea is a white tea rich in antioxidants that may help to, for example, neutralize the germs responsible for cold symptoms. Drinking a cup of tea on a daily basis will help you feel the cleansing effects of tea and keep toxins at bay. Keeping your brain and memory sharp and active is not only great for the struggles of tomorrow, but it is also important as time passes by and age begins to take its toll. This Chinese white tea contains caffeine, which improves your memory and brain activity. At the same time it contains theanine which helps you to remain calm and focused. This is a relaxing and soothing tea. This medicinal tea may also help prevent ailments such as Alzheimer’s disease due to the presence of antioxidants. Give this tea a try! One of the great health benefits of Shou Mei tea is the powerful action the antioxidants present in this tea have in relieving stomach acidity and facilitating digestion. Take a cup of this white tea to soothe stomach pains and reduce the risk of heartburn and indigestion when you overindulge in foods that you have a hard time digesting. By cleansing your digestive tract also means that this tea may help you with constipation, diarrhea and flatulence. Drink this tea with or after your meals. The combination of antioxidants and caffeine in Shou Mei tea may be the key to boosting your metabolism on a daily basis. A healthy diet and a great tea can help your body rid itself of the unnecessary wastes that cause fat buildup. Remember that this tea will not act alone for you to achieve your weight and health goals. A well-rounded diet and regular exercise are highly recommended. If you don’t enjoy going to the gym, start with a daily brisk walk. Put your Shou Mei in a travelling mug and head out with a drink that will both refresh and energize you. Shou Mei contains fluoride and minerals that prevent dental plaque, tooth decay, bad breath or other mouth problems that may be caused by viruses and bacteria. Here’s a tip: If you go out to a restaurant and you are unable to brush your teeth after the meal, then order a cup of unsweetened white tea to drink as a mouth and stomach cleanser. If you would like to, you can learn more information about general white tea health benefits. Do you want to take a sip of this tea? This is a great Chinese white tea, but while both its caffeine and fluoride content may be beneficial to some, to others it may prove harmful. Along with its many health benefits, Shou Mei tea has also the added benefit of having the lowest amount of caffeine when compared to other high grade white Chinese teas, such as Silver Needle or White Peony. Unlike these other varieties of white tea, Shou Mei has a small amount of buds or tips and this is exactly where the tea bush stores caffeine as a defense mechanism for the leaves against insects. However, it also has the lowest amount of theanine, the calming component of tea. So if you are really sensitive to caffeine, even this tea may cause you some lack of sleep. High levels of fluoride in tea may cause thyroid problems. Although white tea is said to have the lowest levels of fluoride, Shou Mei tea may not be the best choice. Fluoride seems to be highest in older tea leaves and since this tea is picked after the first harvest, tea leaves are older and may contain more fluoride. Solution: choose higher grades of white tea such as Silver Needle and White Peony, which are essentially made up of young buds and young unopened tea leaves. The moment has come to taste this wonderful tea. Shall we learn how to brew Shou Mei tea properly? The best teapot to use when brewing this tea is either a ceramic teapot or a glass teapot. The latter allows you to enjoy the dance of the tea leaves in the pot. This tea is brewed with water below the boiling point, at about 80ºC to 90ºC (176ºF to 194ºF), this means you should preheat your teapot before steeping your tea. Preheating your teapot prevents the water temperature from dropping drastically as it hits the cold walls of the teapot and giving you a weak cold pot of tea. Once your teapot feels warm discard the water and prepare fresh water at the proper temperature to brew Shou Mei Tea. Place 1-2 teaspoons of loose leaf tea for every 225ml of water, which is nearly one cup of water, in your teapot. Pour the newly heated water into the teapot and allow your tea to steep for 1 to 2 minutes. Then increase the time with the succeeding brews, not the temperature of the water. This is a delicate white tea so subjecting it to boiling water may not only ruin its flavor by becoming too bitter and the leaves will cook and become unusable for reinfusion. Your tea is ready to serve, but first inhale that sweet fragrance and observe its dark yellow-orange color, the ever reminder of how close this tea is to the oolong type and less like other white teas. Drink it plain, there is no need for sugar or milk. White teas are sweet and Shou Mei is no exception, having a bold fruity taste. Take a sip. Can you taste the sweet and fresh flavor of this tea? It is deep tea with both floral and fruity notes. Use a gaiwan and a small teapot to brew your tea. The water temperature is the same but you should place more tea leaves and steep for about one minute only, making sure to empty strain the tea all the way with each brewing. Buy Your Shou Mei Tea Today! Click on the image or on the link below to purchase from Starwest Botanicals your Shou Mei/Shu Mee. Make your tea with this loose leaf white tea and start your day feeling great. Shou Mei is a unique white tea that deserves a place in your tea collection. Full of health benefits, it is indeed a great Chinese tea. Enjoy this special fruity white tea!